Stink bugs invade Georgia; Russia blames the U.S.
Could an insect war be hatching in the Caucasus? Something caught the eye of Georgian President Giorgi Margvelashvili in the middle of a speech last month. He angled his head to take a better look, losing his train of thought about Georgia’s Euro-Atlantic future. “Why, I think I just saw a stink bug!” he exclaimed. “Shall I kill it?” Laughs rippled through the audience and the cameras homed in on the intruder. Ambling on stilt-like legs was a tiny beast with a shield-shaped body, brownish mottled back and a pair of antennae bending outward. The president was right. He was looking at the new national nightmare, the brown marmorated stink bug, known in Georgia as parosana (“shield bearer”). This foreign intruder – known to scientists as Halyomorpha halys – started appearing in Georgia three years ago and since then has overrun hundreds of homes and many acres of farmland in the western part of the country. Homeowners tell stories of spending their nights battling the swarms with mops, shoes or whatever weapons come handy. The bug fights back by wafting its signature fetid odor. Parosana even meddled in municipal elections last year, with some of them climbing into ballot boxes. Native to Northeast Asia, the pest has in recent decades become a global problem. While a nuisance for households, it is a disaster for farmers. The bugs feast on fruits and vegetables. The United States has seen the bugs repeatedly devastate crops over the last decade; Italy called for Brussels to intervene last year after stink bugs attacked fruits including apples, pears and kiwis. This year, New Zealand denied entry to four freight ships from Japan after specially trained dogs detected the bugs aboard. Meanwhile, Georgia has become an all-you-can-eat restaurant for the stink bug. It is not hindered here by sophisticated state-pest-response systems, as in the West, or controlled by natural predators, as in Asia. The bug began by wiping Abkhazia clean of its tangerine and hazelnut harvests – the small, Russia-backed separatist region’s lifeline. Then it advanced into Georgia proper to attack more hazelnut orchards and cornfields. Production of hazelnuts – Georgia is among the world’s five biggest producers – suffered $24 million in losses in 2016, a significant share of the $167 million in hazelnut and walnut exports that year. “It is absolutely the worst plant pest that we have ever faced,” Nikoloz Meskhi, head of the Plant Protection Department of Georgia’s National Food Agency, told Eurasianet. The bug is now marching on the capital, Tbilisi, and eastwards toward Georgia’s famed vineyards. The government is deploying men and machines to contain the invasion – and holding out for a samurai. Georgia plans to begin importing Japanese samurai wasps (Trissolcus Japonicus), parasitic insects only 1-2 millimeters long that lay their eggs inside the eggs of the stink bug. The wasp develops inside the egg and chews its way out, killing the unborn bug. “In China, Korea, and Japan this tiny wasp is responsible for over 70 percent mortality of the brown marmorated stink bug,” Greg Krawczyk, an entomologist and associate professor at Penn State University, told Eurasianet. In the U.S., these wasps are now reared and set upon the stink bug. Georgia wants to emulate the practice, but first must gauge the impact this exotic species may have on native fauna. “We know that it does not harm humans and beneficial insects, like bees,” Meskhi said, but the effects on other endemic insects has yet to be assessed. Until the samurai arrive, authorities are relying on poisons to snuff out the stink bugs. Some 300,000 acres were showered with pesticides last year at a cost of $20 million. The plan is to cover twice as much ground this year, Meskhi said. But this effort also is hitting some surprise snags. 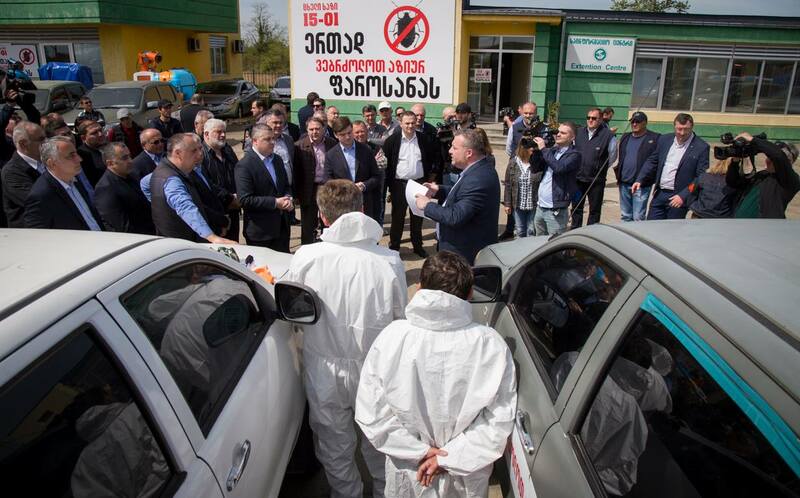 Last month, specialized vehicles sent to spray the poison in the western region of Samegrelo had their batteries and tires stolen overnight. Police have yet to catch the thieves, inspiring jokes that parosanas themselves had a hand in the heist. The battle with the vermin took a tragic turn in nearby Ozurgeti municipality, where a man was poisoned after he fumigated his house. His family claims the man was using the government-distributed anti-stink bug poison. The National Food Agency said that the bifenthrin-based insecticides that they handed out were only approved for outdoor use. Even so, the brown marmorated stink bug has developed some resilience to pesticides and tends to bounce back in untreated areas. It is an excellent hitchhiker, often catching long-distance rides on vehicles. The bug is even making a stink in Georgia’s politics, provoking fierce political squabbles, with government opponents accusing the authorities of a slow and clumsy response to the crisis. There’s also been friction on the foreign-affairs front. Georgian authorities traced the pest’s path to Russia, which, as one newscaster put it, ranks alongside the stink bug as Georgia’s top enemy. The bugs had been wreaking agricultural havoc in Russia’s southern Krasnodar region before appearing in Georgia. For their part, the Russians have blamed the Americans. In a Cold War-style allegation, Russia’s animal and plant surveillance agency, Rosselkhoznadzor, asserted that American military scientists developed a mutant version of the stink bug in an American-funded biomedical laboratory in Tbilisi to wage an entomological war on Russia and its ally Abkhazia. “The stink bug in Abkhazia produces new generations six times per season, which is a colossal increase [from the norm]. It did not happen without some genetic modification,” declared Yulya Melano, an official with Rosselkhoznadzor. The stink bug reproduction cycle, in fact, depends on the climate. In Georgia, one bug can lay about 250 eggs per year. Earlier this year, Russian agricultural authorities asked farmers in Abkhazia to collect and hand over buckets of stink bugs, offering to pay about $17 per kilo of live insects. The stated goal is to reduce the bug population and to study its behavior. Cash-strapped Abkhazians went bug-hunting en masse, harvesting two tons – or $34,000 worth – of live insects by mid-April, according to the region’s de-facto agriculture authorities. While Russia is helping its protectorate, the U.S. aided its ally Georgia with financial and technical assistance. The Americans helped set up a pest management program, placing about 20,000 pheromone traps across the country to measure stink bug numbers and identify the most affected areas. “We have people going out to the fields to look at the traps. They use smartphone apps to feed surveillance data into an interactive map that helps inform our response effort,” said Meskhi. Georgia is studying the experience of Pennsylvania, which was first state to detect the stink bug back in the late 1990s. Georgia has launched a project to educate the public about ways to exterminate the critters, Stop Parosana, based on a similar American effort, StopBMSB.org. Italy, the main consumer of Georgian hazelnuts, also sent stink bug experts to train nut producers. Meskhi says it will take a combination of methods to keep the stink bugs at bay, and complete eradication is unlikely. Ultimately, he believes, the samurai wasps are going to save the day, but entomologists warn it will take time before the wasps establish themselves in large enough numbers to have an impact. Giorgi Lomsadze is a journalist based in Tbilisi.